^ Namegiving of newbuilding L 203 (新闻稿). Odense Steel Shipyard. 2006-12-08. （原始内容存档于2007-07-13）. ^ 3.0 3.1 3.2 Rowlett, 2004. ^ 4.0 4.1 4.2 4.3 Container Shipping. damovers.com. damovers.com. [2008-03-22]. ^ 5.0 5.1 5.2 businesspeek.com. 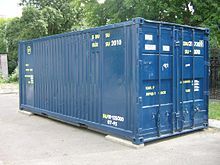 Shipping Container Basics. businesspeek.com. businesspeek.com. 2006 [2008-03-22]. ^ 6.0 6.1 6.2 6.3 Shipping containers. Emase. [2007-02-10]. （原始内容存档于2009-04-20）. CIRCA. Glossary: TEU (Twenty-foot Equivalent Unit). The European Commission. 2008 [2008-03-20]. （原始内容存档于2008-04-14）. BusinessDictionary.com. twenty-foot equivalent unit (TEU). BusinessDictionary.com. 2008 [2008-03-20]. Bohlman, Michael. ISO's container standards are nothing but good news (PDF). ISO Bulletin (International Organisation for Standardisation). September 2001: 15 [2008-03-20]. Organisation for Economic Co-operation and Development. Twenty Foot Equivalent Unit (TEU). Glossary of Statistical Terms. Organisation for Economic Co-operation and Development. 2002-06-19 [2008-03-20].